Looking for unique gift ideas for the special 8 to 11 year olds in your life? Here are my top picks for this Christmas! 1. A simple & sweet necklace in sterling silver perfect for tweens and teens! This necklace has one freshwater pearl and a sterling silver charm and can be hand stamped with an initial of your choice. 2. Your child can become a pottery pro with a real pottery wheel and a variety of included tools that lets them mold, shape, sculpt and paint their own pottery! 3. The Duo-Scope is a dual functioning biological microscope that incorporates modified objectives with dual cool LED illumination, allowing kids to view both microscopic sized specimens as well as macroscopic objects like bugs, stamps and coins! 4. We made marshmallow shooters for my step-brothers a couple of years ago, and they were a hit! Shoot miniature marshmallows and pompoms over 50 feet! 5. Great for your active girl, this 20″ bike has real air tires, full bearing construction, a quality coaster brake, handlebar pads, alloy rims, fully enclosed chain guard and a kickstand. 6. This sketch pad lets your aspiring designer draw fashions and accessories on the Fashion Angels models. It comes with removeable, plastic stencil cards with 100+ fashion and accessory shapes and 40 drawing pages. 7. The ultimate spy tool, packed with high tech spy features! This spy watch includes a real working video camera and microphone to record video, audio and even photos! 8. 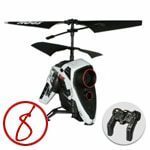 Another great gift for you super spy, the Hawk Eye has fully functional control in flight plus a camera for recording from the air! 9. Ucreate Music is an easy-to-use digital music-making system that allows kids to mix music just like a music producer. Kids and teens can express themselves as they create their own songs, performances and re-mixes with the fun and innovative interface.